Hayes catcher Alex Kelly finished with two hits and two RBI as the Pacers knocked off visiting Marion Harding 5-1 in the first round of the Division I district tourney Monday in Delaware. The Delaware Hayes baseball team jumped out to a 2-0 lead through three innings and plated three in the fifth to take control en route to a 5-1 win over visiting Marion Harding in the first round of the Division I District Tournament Monday in Delaware. After Jason Cross worked a 1-2-3 top of the first, the Pacers secured the early edge when Cole Barton scored on a groundout by Zach Miller. Barton opened the inning with a walk and went to third on a single by Dominic Byers. The Pacers (10-12) doubled their advantage in the third, when Alex Kelly plated Byers with a clutch two-out, two-strike single to center. Byers doubled and stole third — his second steal of the game — to set the table. The Presidents sliced their deficit in half with a run in the fourth, but Hayes all but sealed the deal with the three in the fifth. Miller and Kelly each had RBI singles in the inning while Zach Price added a sacrifice fly to chase home Miller with what proved to be the final run of the game. Byers and Kelly led the Pacers with two hits apiece. Byers scored twice and Kelly knocked in two runs. Barton, meanwhile, had a hit and scored twice while Miller had a hit and two RBI. Cross took care of the rest, allowing an unearned run on five hits while striking out six to collected the complete-game win on the mound. Next up, 36th-seeded Hayes will take on third-seeded Grove City in the second round Wednesday in Grove City. First pitch is slated for 5 p.m.
Grove City Christian 13, Delaware Christian 1, 5 inn. Host Grove City Christian scored five first-inning runs and never looked back, rolling to a win over DCS in the first round of the Division IV District Tournament Monday afternoon. Isaac Rindfuss had Delaware Christian’s only hit. East Knox 6, Big Walnut 3, 10 inn. 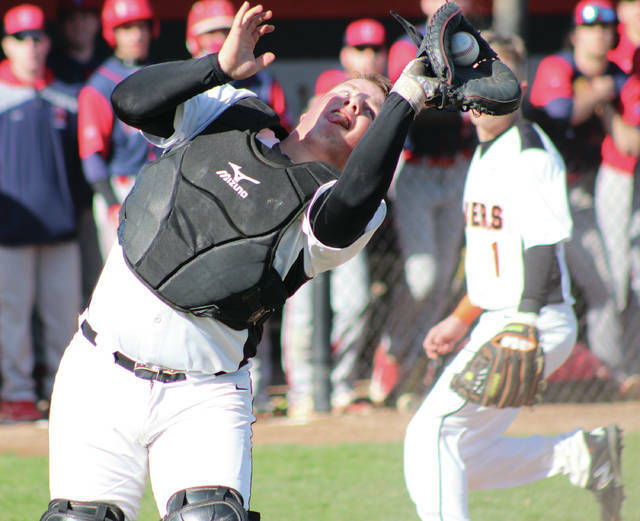 Nathan Lawyer scored on Jackson Seiple’s bunt to tie things up in the sixth, but visiting East Knox scored three times in the 10th to secure a non-league win Monday in Sunbury. Lawyer sparked the BW offense with three hits and a pair of runs scored. Emily Parrish and Grace Williams had two hits apiece, but it wasn’t nearly enough as Delaware Christian fell to host Fisher Catholic by a 9-3 margin in the first round of the Division IV District Tournament Monday afternoon. Paige Milhon played the role of the hero Monday, as her two-run single in the bottom of the ninth inning led the Barons to a thrilling walk-off win over the visiting Vikings. Olivia Schick had four hits in the win while Alexa Richardson finished with three RBI for BV, which rallied from a two-run deficit in the ninth. Delaware Hayes got back on track Monday, sweeping away visiting Marysville for a 5-0 non-league win. Pacer standouts included Kyle Klumpp, who earned a 6-3, 6-4 win at first singles; Sam Bonofiglio, who sailed to a 6-0, 6-0 win at second singles; Eric Puthoff, who won 6-0, 6-1 at third singles; the duo of Danny Brennan and Will Fogle, who teamed up to notch a 6-2, 4-6, 7-6 win at first doubles; and Justin Sanclemente and Aidan Sarna, who won 6-4, 6-4 at second doubles. Hayes will look for its second win in as many days when it hosts Bishop Watterson today at 4 p.m. The Golden Eagles picked up a pair of singles wins and took care of business at second doubles to slip past the host Warriors Monday in Westerville. Big Walnut winners included Gabe Mexicott, who rallied for a 1-6, 6-2, 6-1 win at second singles; Cameron Sutherland, who won 6-2, 6-1 at third singles; and the duo of Collin Bates and Tyler Shuster, who won 7-5, 6-2 at second doubles to smooth out the scoring summary. Also: Wellington 3, Olentangy 2; New Albany 4, Olentangy Orange 1.